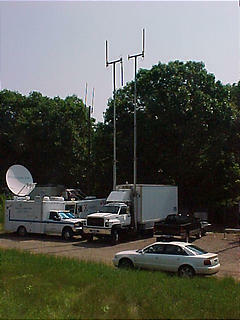 All of the major mobile phone carriers have Cells-On-Wheels (COW) and Cells-On-Light-Trucks (COLT)-- vehicles to restore mobile phone service or add additional call capacity in the event of cell tower failure or another emergency situation. These vehicles have been deployed to strategic locations in Florida in advance of Hurricane Charley's landfall. A COW is self-contained, fully-functional portable cell sites that can replace existing cell towers for an indefinite period of time. They are typically either large trailers pulled behind a service truck or they are built into the rear of a 16 to 24-foot straight truck. COWs can support the full range of voice and data communications. A COLT is a smaller portable cell site. It is typically installed into the rear of a smaller truck and is designed for smaller call volumes and shorter deployments. The photo in this article shows a Verizon Wireless COW (the large, white straight truck on the right), and a Cingular Wireless COLT (the smaller white truck with the Cingular logo on it, partially obscured by the truck with the satellite dish on top of it. Note that the Verizon COW has dual antennas that extend higher than the COLT's single antenna. Actually they used these near the Pentagon post 9-11 to try and triangulize (sic?) the cell phones of possible survivors. They stayed there for about six months after as I guess there were so many people working outside they needed the exta coverage. The Cell On Wheels provides the emergency services to the vehicles whenever they need it. I have written custom assignment writing review about this topic some blog that many are getting these services to their vehicles. Very nice article posting by you keep it up we supported you. Sage 50 technical support phone number 1800-796-0471 is always there for the sage users who can face common errors while using the software. You can email us, call us, live chat is also available or you can also visit FAQ page. Our sage team is available 24x7. Sage 50 Technical Support Number: Instant supports on all Sage versions. Sage Support Phone Number, Our certified team is available 24*7 USA & CANADA. Remoteaccounting247 is a company which is in the field of accounting. From past many years, we are providing services QuickBooks Technical Support, QuickBooks Support Near Me, QuickBooks Accounting Support, QuickBooks Error Support, QuickBooks Payroll Support, QuickBooks POS Support and much more. We are a team of professional accountants who provide one-stop professional service. To contact us call our toll-free number +1-800-961-6588 or visit our website. Get quick help and support here. We are the third party who gives the best solutions for AOL gold Email user. If you are troubling with AOL Email. If yes, dial AOL Toll-Free Number +1-800-279-1380. We have the best suggestion for your AOL missing email problem. We are available 24*7 for your help and support. we are providing the Quicken Toll-Free Number +1-800-329-1074 for Windows. If suddenly your Facebook page has been unpublished then contact Facebook customer service team and get instant help. Facebook expert are available all the time for those people who have some technical error on Facebook. If someone has hacked your AOL email account and you need some help, then dial AOL Phone Number. AOL experts are active for AOL users all the time. HP Support service to solve trouble on the HP all products. Our technicians work for technical and nontechnical problems on the HP. Our HP support is always ready to solve issues regarding the HP laptop, HP printer, HP computer etc. HP users can reach us through the HP Customer Support Number. If you are not able to fix problems about Quicken, you can call us at an Quicken Helpline Number, our technicians will help you do this.